Help your sick bird to breathe better! Take your bird to the vet for antibiotics. Cut a tissue into small rectangles. Roll half of each rectangle between your fingers to create a point. Gently clean your bird’s nostrils by using the pointed tissue area to soak up the mucus inside each nare. Use a clean tissue each time you wipe its nose. 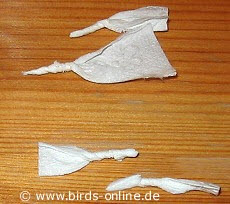 Use caution to ensure you don’t put the tissue too far into your bird’s nares.